It’s here! All my bags are packed, and I am Vegas bound! I’m so pumped for my girlfriend’s bachelorette party in Las Vegas. Thanks for your suggestions on daytime things to do. Ya’ll had some good ideas for me. Awkward timing considering I’m in vacay mode right now, but today I’m sharing a little work day outfit inspiration. These pieces are two of my favorite work wear additions for fall. First, these gray work pants are hands down my favorite. I now own them in black, maroon, and gray. I also plan on buying more colors as the seasons change. These pants are comfy with a hint of stretch. They stay pretty wrinkle free throughout the work day. I’m 5’3, and I find the petite pants at Loft are the perfect length for me. I’m a layering girl during the work day. My office is cold, outdoors is usually not. So anytime I find a cute easily layered top, I swipe it up. This top is gorgeous standing alone or layered under a gray, black or ivory cardigan. You can also pair with a blazer or even a leather jacket for an edgier look. Outside the office, pair this top with jeans for a weekend date night outfit or with a leather skirt like I did here for a little blogger happy hour last weekend. It’s so versatile, and it also comes in black. I’m heavily considering buying the black one, because you can never have too many black tops. Sizing note: I’m wearing the small, but after wearing a couple times I think I probably could have gone down to XS. The arm holes are the area that are the slightest bit big and can show the bra a bit. Not really noticeable probably to anyone but me. Alright ya’ll have a great weekend, and I will see you back here next week. Thanks for reading! I need to check out those pants because I am pretty short, too! 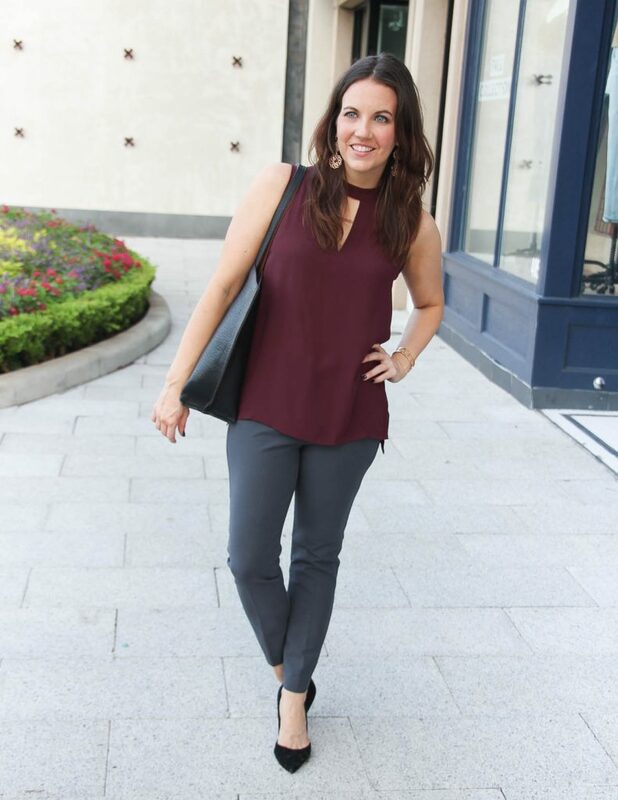 Your top is such a perfect fall color! Thank you so much for joining On Mondays We Link-Up! I have this top, love it! I too thought it came in black until I looked closer and realized it’s actually Navy! That’s a beautiful top and I love the pants! I need classic pants like this for work, it’s a big gap in my wardrobe as it’s hard to find affordable petite friendly ones here – I’m a little shorter than you. Hope you’re having a lovely week and enjoying Vegas! After a tough week with an unwell toddler, I’m looking forward to the weekend!